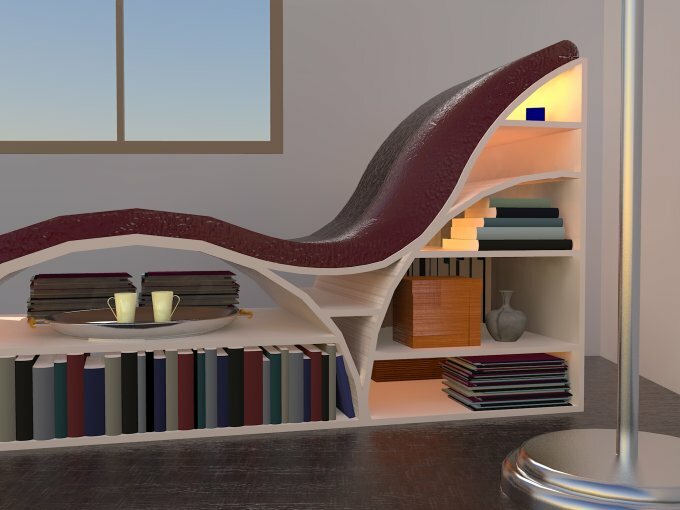 Chaise Lounge in Kerkythea - Awesomely realistic! Trying something new here - rendering with the big one, Kerkythea! 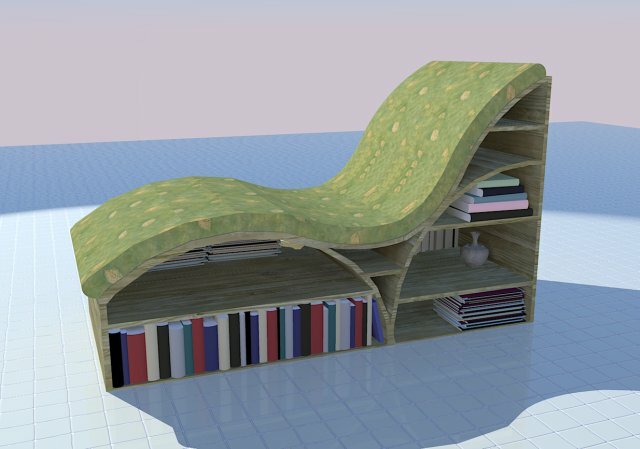 I've been brewing this chaise lounge - a fancy wording for a recliner - idea in my mind for a while now, thinking up various designs and materials. 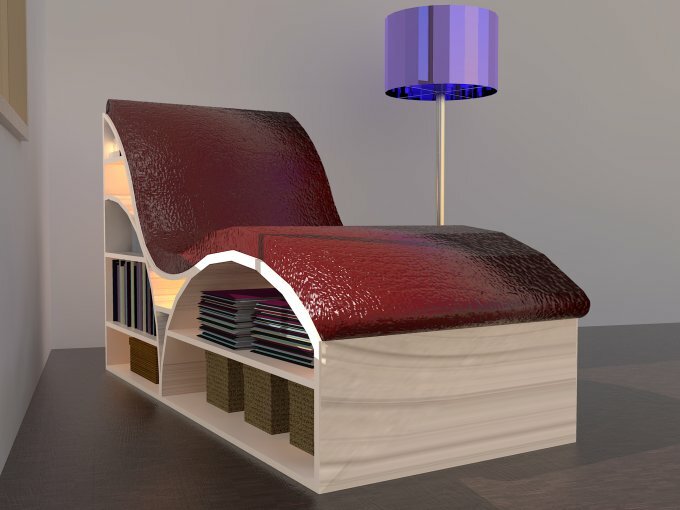 Well, I knew that I would use Google SketchUp for modeling it, but the rendering options are somewhat limited, making it difficult to really showcase the potential of this design. As you've already seen in this section of Dedoimedo, Kerkythea is a very powerful tool that complements Google SketchUp very nicely. 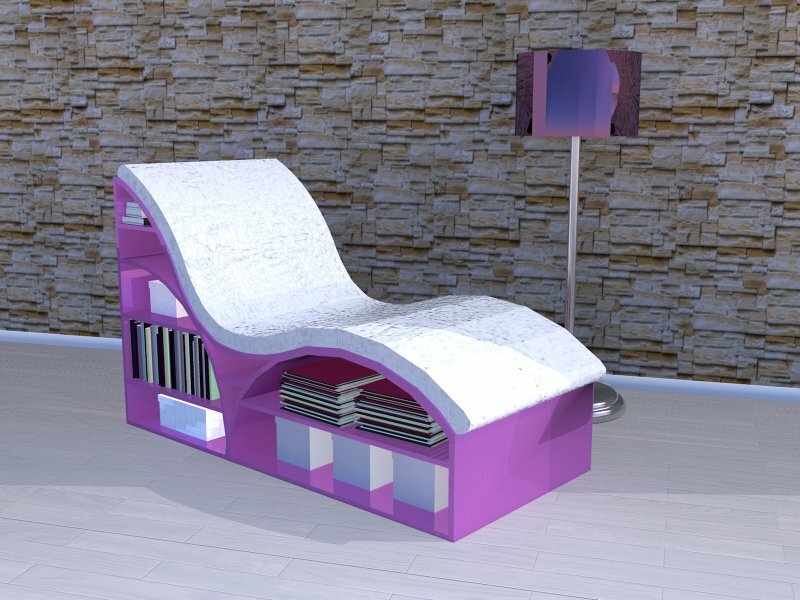 So, I created the model from scratch - yes, the chaise itself, the tray, the coffee mugs, the books and magazines and even the little Rubik's Cube on the top shelf. 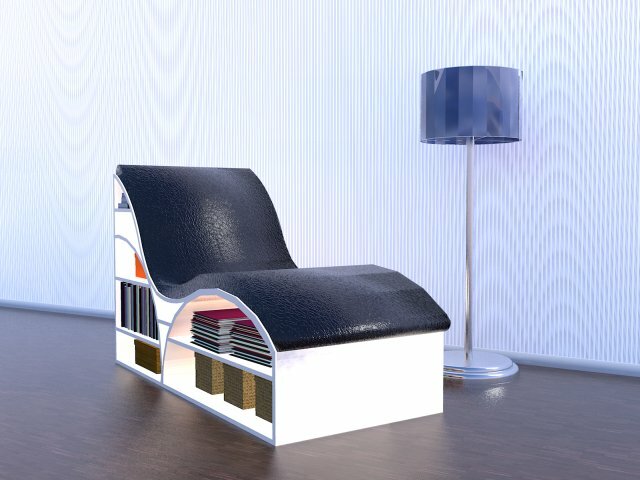 The idea behind this design was to incorporate storage into the chaise lounge, since most of the time, if you're using one, it's probably for reading. I created some interest with a few curving lines, so it wouldn't look too boxy and started rendering away. Here you can see some of the early stages of this design. I tested several materials and angles as I got acquainted with Kerkythea. I added a lamp, some accessories and tried some new angles. I created a walled setting, where the complete chaise lounge can be seen in a different light, as it passes through the window. Later on, I changed the positioning of the wall and started modifying the various materials that could fit into different design schemes. 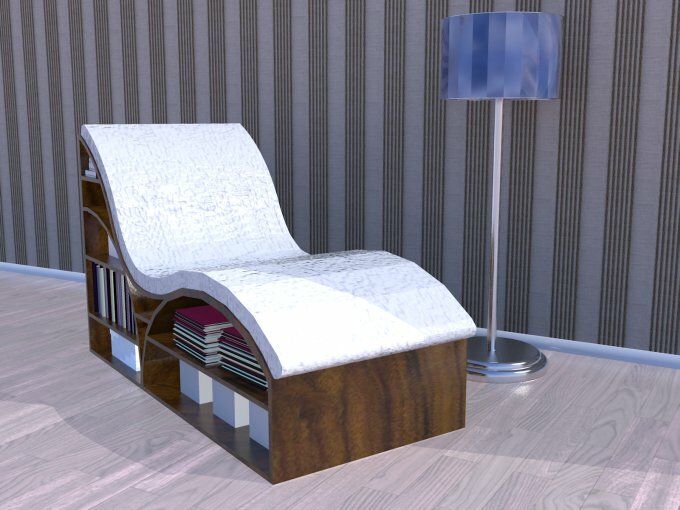 The next image shows the chaise lounge in a semi-traditional setting. 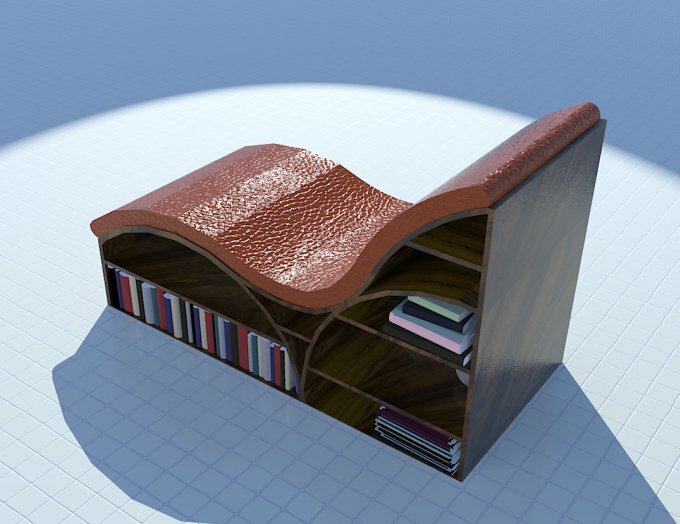 It is made of polished mahogany wood with white leather upholstery. It is set on a light colored wooden floor and against a neutral striped wallpaper. 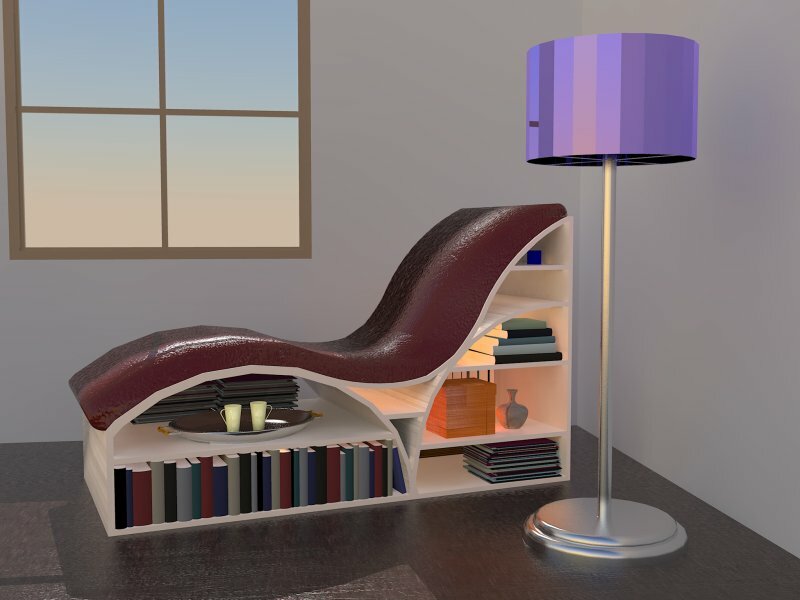 The accessories are mostly white, in order to contrast the mahogany, but complement the flooring. This is a less traditional scheme. 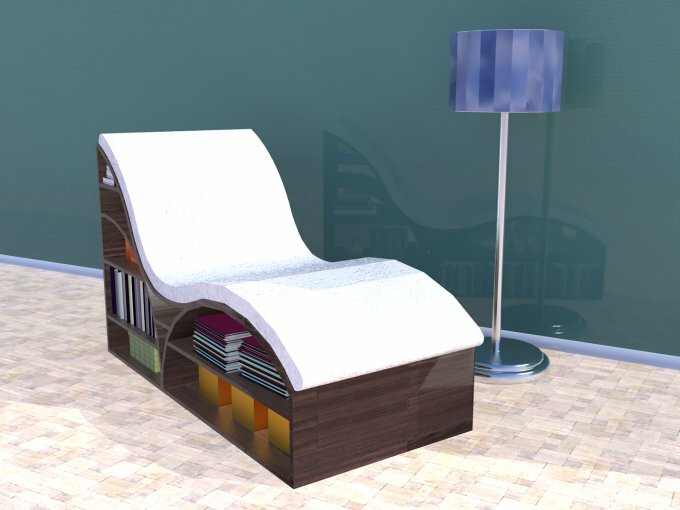 The chaise lounge is white, with blue leather upholstery. The wallpaper is still striped, but it is also in blue tones, to enhance the color of the leather. This one is pink with white leather upholstery. It is set on a white wooden planks floor and against a natural stone wall. Again, the accessories are mostly white, standing out against the pink. The natural stone wall is slightly counter-intuitive to this modern version of the chaise, but it is neutral enough to allow for the chaise to take center stage. In this design we are playing with a traditional/modern balance again. The flowery wallpaper and dark hardwood floors set a more traditional mood. 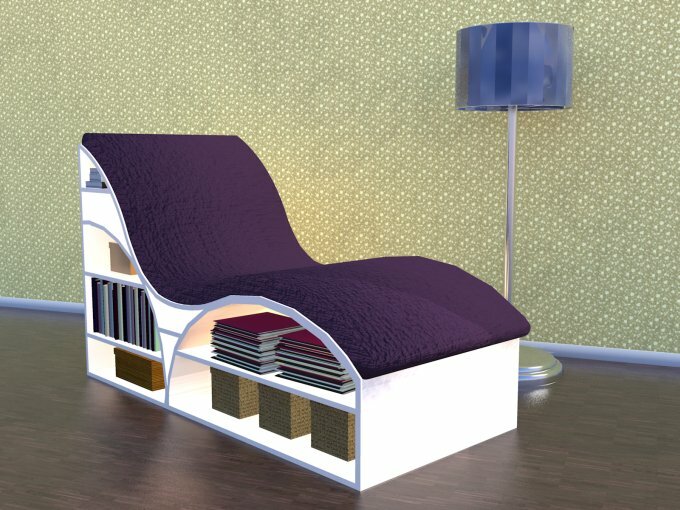 However, the white chaise with the purple velvet upholstery fits in well. 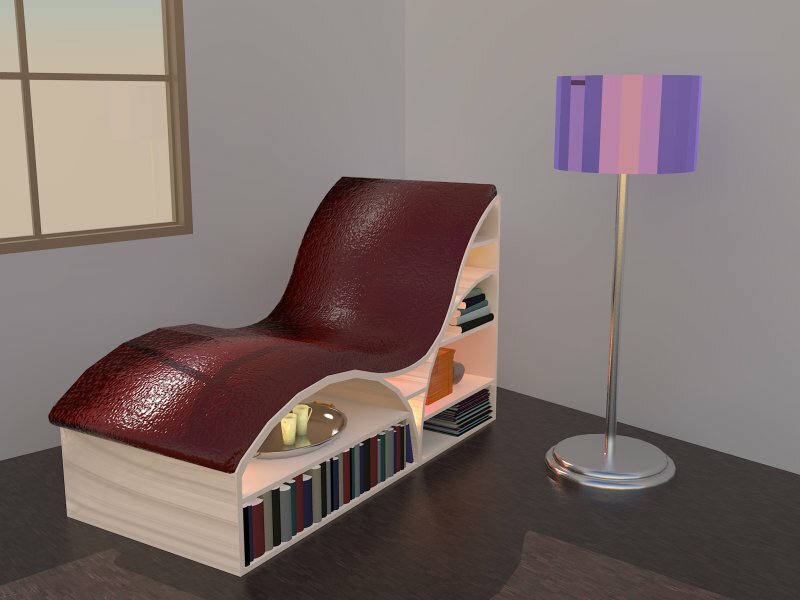 Additionally, the accessories, in the same tones as the wallpaper, help the chaise blend into the design. A similar concept can be seen in the below snapshot. 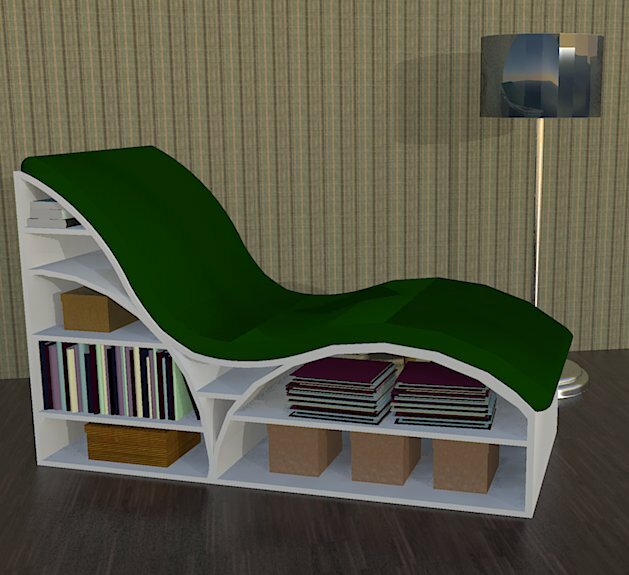 A traditional setting, with a modern chaise in white and green. 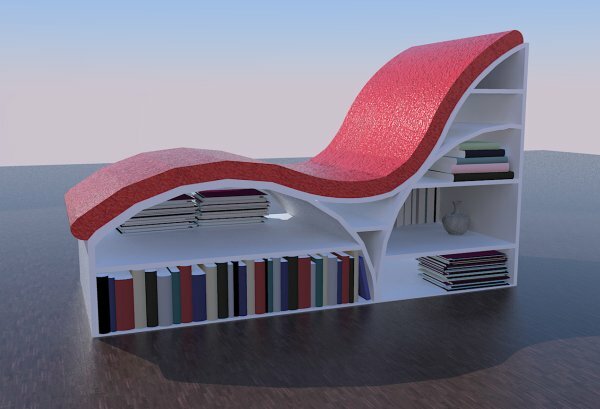 Here we have another take on the balance between traditional and modern. This time, the furniture is more traditional, but it is set against a reflective blue-tile wall that provides an unexpected element to the design. 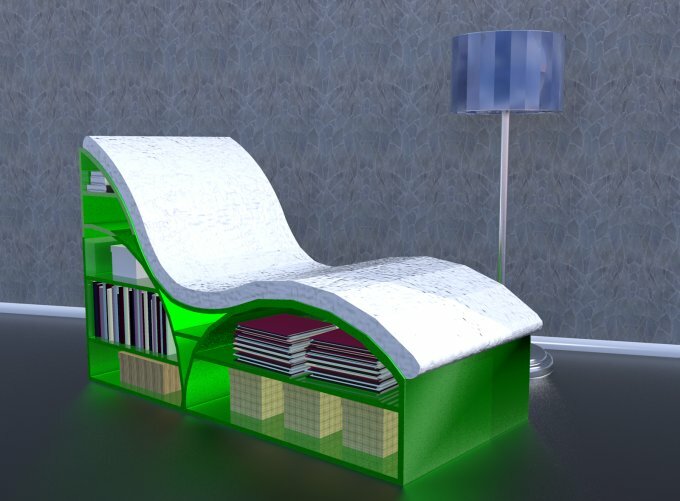 Eventually, here we have a fully modern design scheme, with black glossy floor that reflects the unusual wallpaper and the acid green metallic chaise. This scheme may seem a bit dark, but this can be resolved by good lighting, preferably natural. 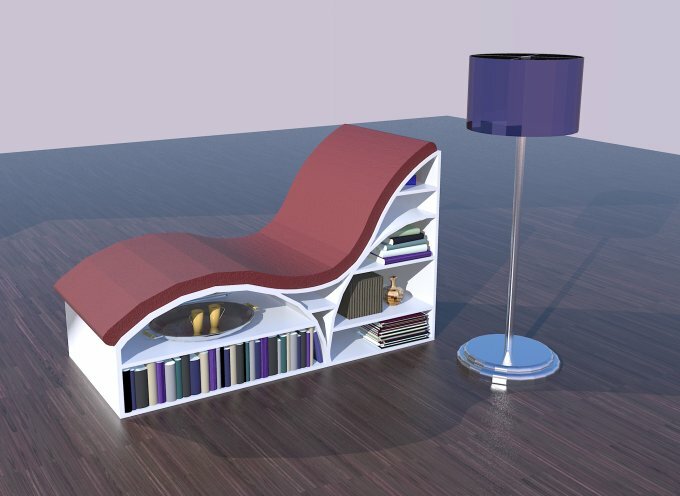 This piece of furniture is very versatile from a designer's point of view, with the ability to fit into any design. 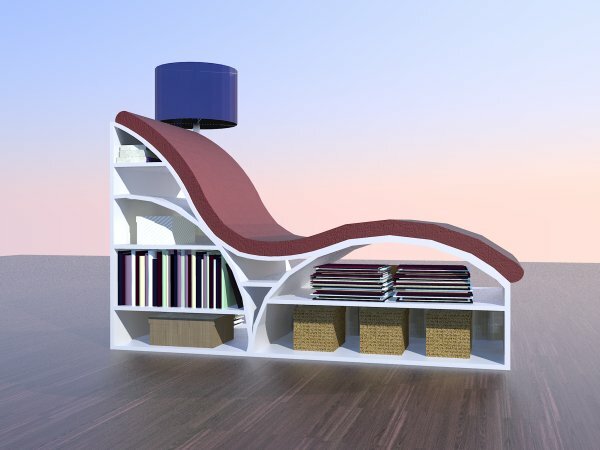 It incorporates the familiar chaise lounge with easily accessible storage, that can also be used as a design feature. Best of all, Kerkythea design rocks. The model looks astonishingly realistic, you must agree. All in all, I would like to have one of these in my home.